Arnold & Son | 210'000 € Tax inc.
Deftly blending its rich British heritage and superior watchmaking ingenuity, Arnold & Son presents a superb timepiece that reflects its famed past with a visionary look forward. 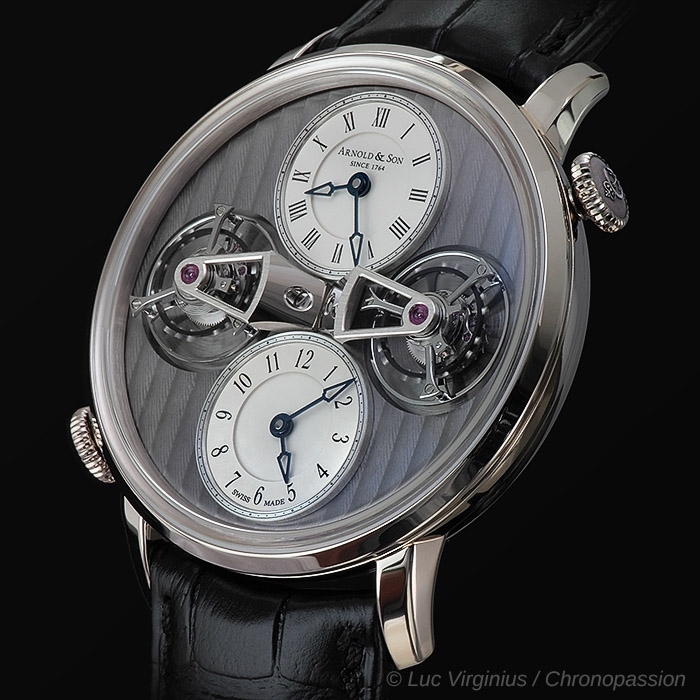 The unique and impressive Double Tourbillon Escapement Dual Time watch - DTE - is a marvel of mechanical mastery and aesthetic elegance. 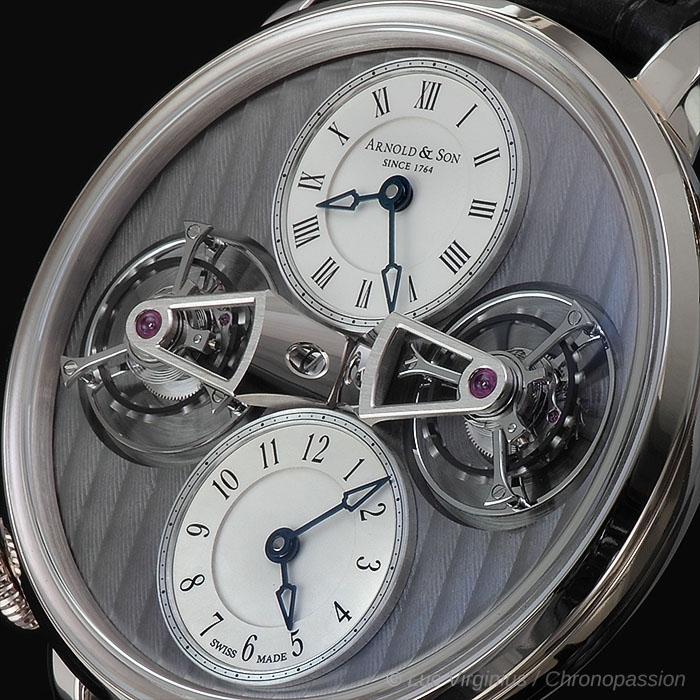 Renowned for its innovative technology and technical prowess Arnold & Son continually brings horological excellence to new heights. 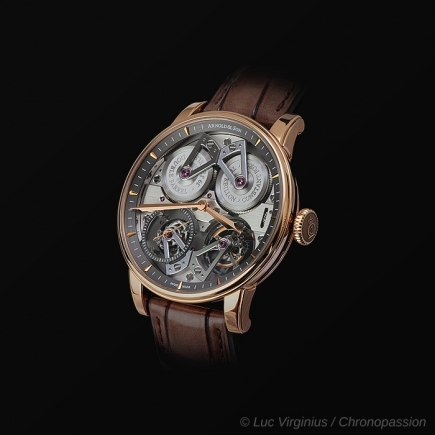 Such is the case with the new DTE reference, which joins the brand's much-coveted Instrument Collection, whose signature is in-house manufactured movements inspired by the timepieces produced during the second part of John Arnold's life when he and his son, John Roger, dedicated themselves to the quest for absolute precision. 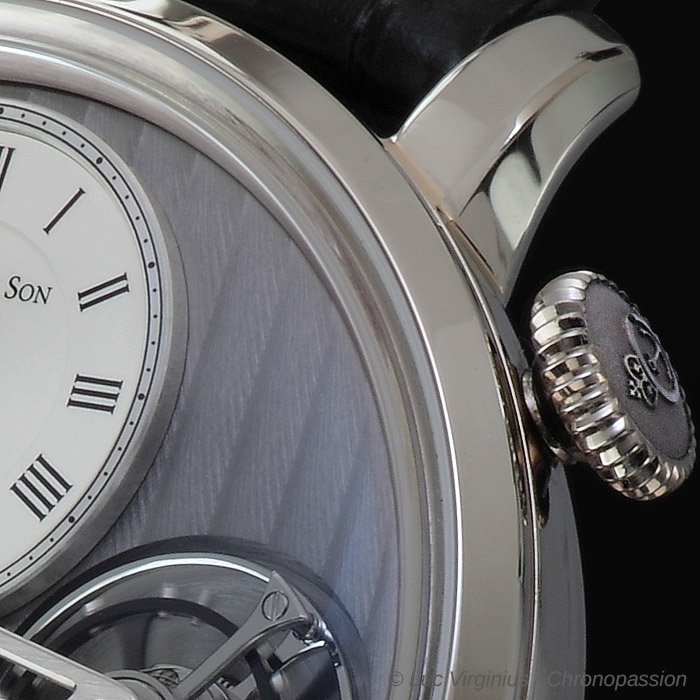 Arnold & Son can easily be considered one of the fathers of modern marine timekeeping. 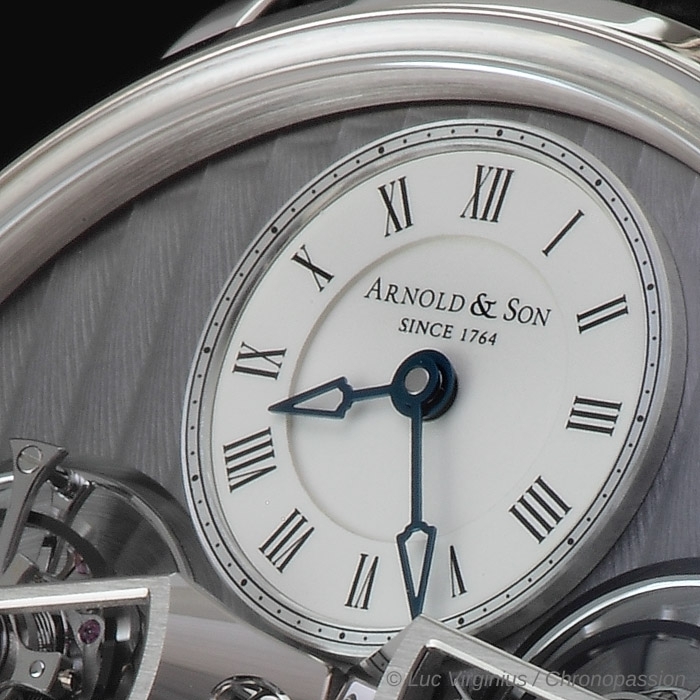 Arnold & Son developed and produced chronometers that solved the 18th-century problem of determining longitude at sea (also, thereby establishing themselves as official suppliers to the Royal Navy). Clearly one of the greatest watchmakers in history, John Arnold shared his knowledge and passion with Abraham-Louis Breguet. 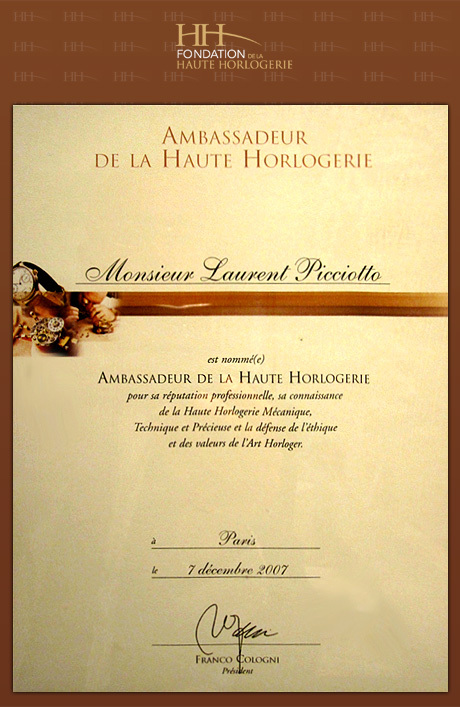 Evidence of their partnership is Breguet's first ever tourbillon cage (No. 169) mounted in John Arnold's No. 11 movement, a watch that can be found today in London's British Museum. The DTE is a masterpiece of symmetry, balance and three-dimensional beauty combined with technical foresight and ultimate performance precision. The watch, powered by the mechanical hand-wound calibre A&S8513, brings the centuries-old tradition of double movements back to life - in 21st century style. It features two separate time zone displays - each of which can be set independently from the other thanks to dedicated setting mechanisms. 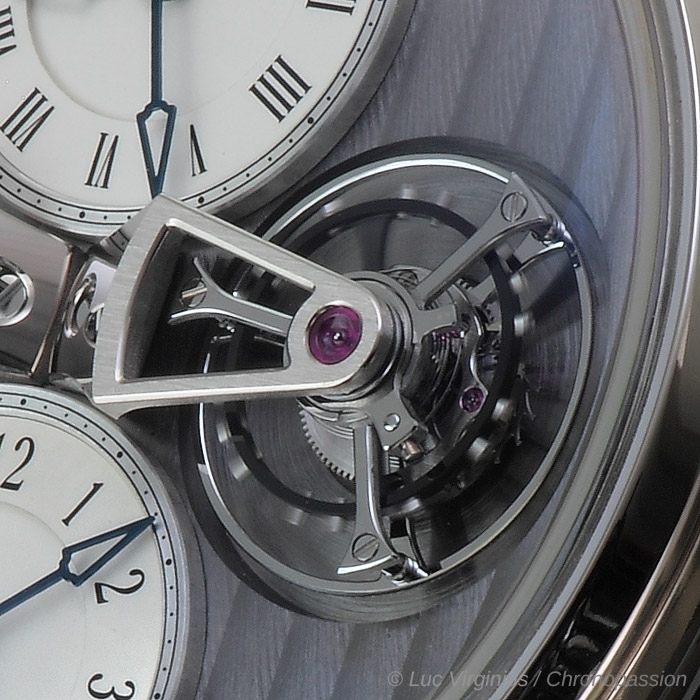 Each has its own gear train and its own tourbillon escapement. 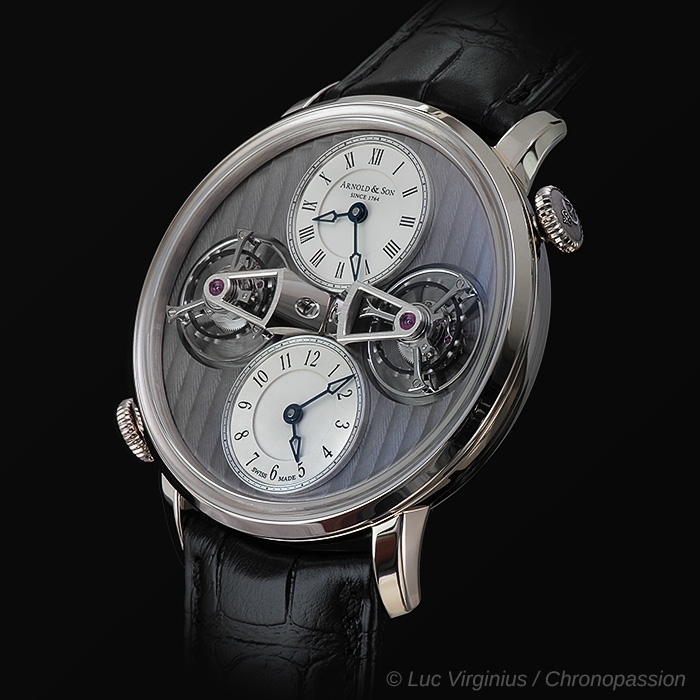 In addition to the double tourbillon escapement and the dual dial/dual time indication, the watch is incredibly efficient in that it not only offers local time in hours and minutes, but also offers hours and minutes of a second time zone to be set separately - thereby enabling the wearer to have precise time in zones that differ from Greenwich Mean Time by quarter- or half-hour increments. The double barrels of the watch offer a superb 90 hours of power reserve. 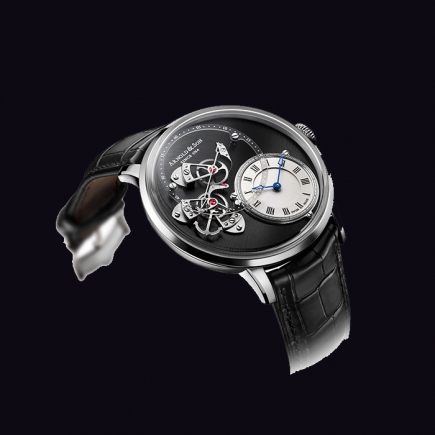 In typical Arnold & Son style, the watch is incredibly detailed and features superlativeHaute Horlogerie finishing. 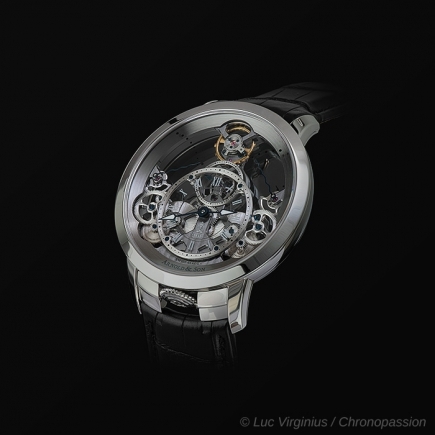 The dial side of the timepiece offers symmetry and depth. 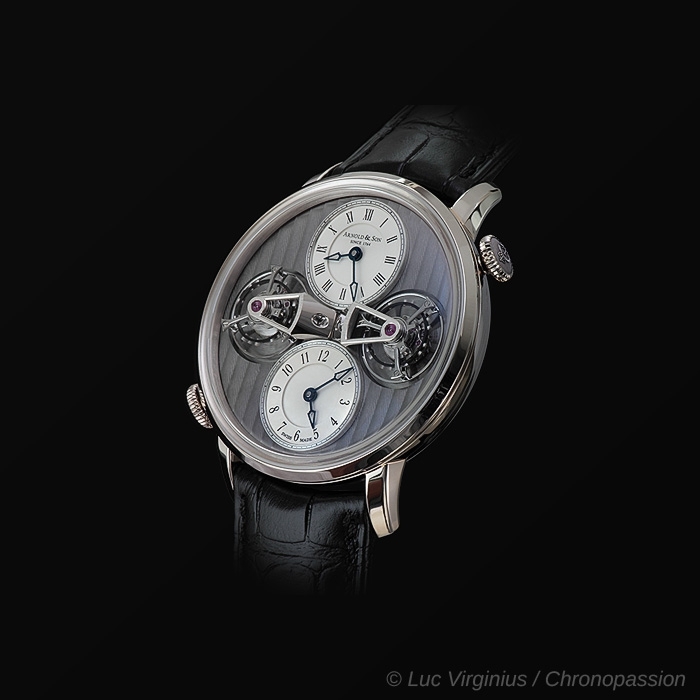 It features two silvery opaline dials - one each at 12 o'clock and 6 o'clock - for the dual time displays. 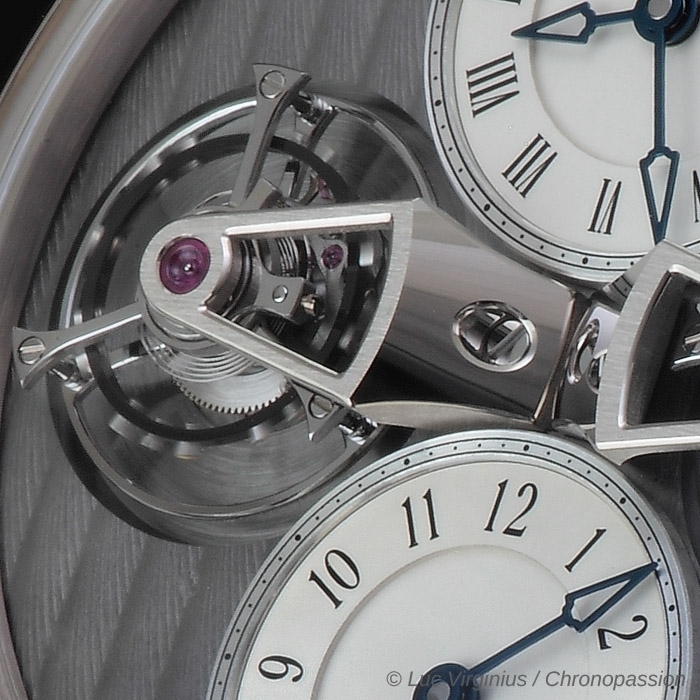 The two tourbillon escapements are harmoniously balanced at 3 o'clock and 9 o'clock and seem to float over the dial thanks to their alluring raised 18-carat white gold bridges. The backdrop for these double dials and double tourbillon escapements is a magnificently decorated vertical Côtes de Genève stripes plate treated in NAC grey. The two crowns - one each for setting the local and the home time - are located at 2 o'clock and 8 o'clock, and the two mainsprings are wound using the crown at 2 o'clock. The 43.5 mm DTE is created in 18-carat white gold. 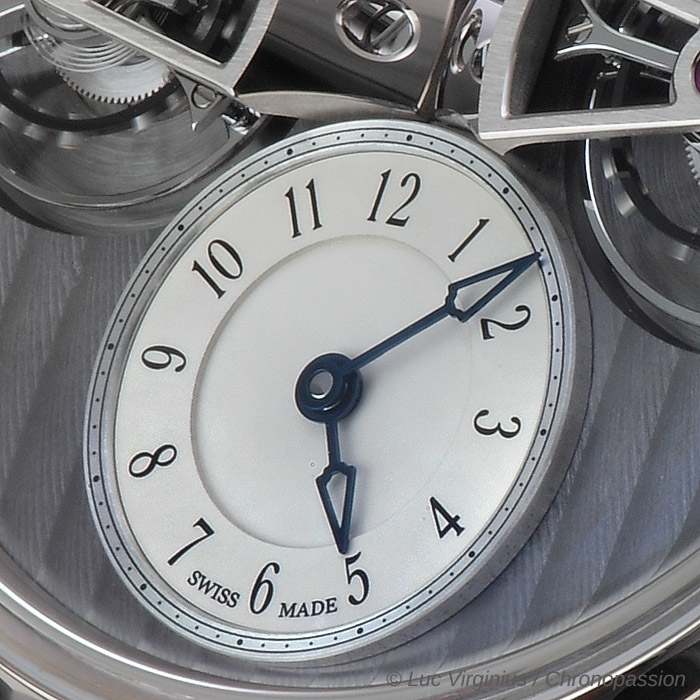 The silvery opaline dials (with Roman numerals in one and Arabic numerals in the other) are accented with blued hour and minute hands. 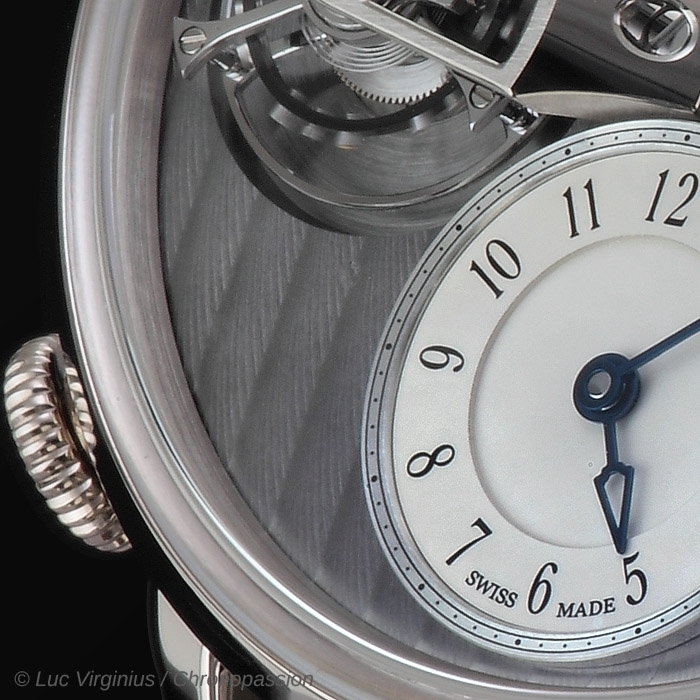 The back of the watch features a transparent sapphire crystal for viewing the splendidly decorated nickel-silver movement with NAC grey treatment. - Satin-finished and mirror polished surfaces with hand-chamfered and polished edges - Hand-chamfered and mirror-polished tourbillon cages.